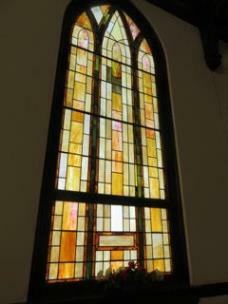 In a chattanoogan.com story posted on Jan. 29, I profiled several historic former United Methodist churches that had ceased being churches for that denomination. My interest had come from the fact I am a United Methodist and love historic architecture and community and social history. Of the five churches I stopped at and photographed, my favorite was probably the old Manker Memorial Methodist Church at 2625 N.
Chamberlain Ave. in the heart of East Chattanooga. With somewhat unusual-colored light brown brick, interesting classic design features and a setting on some grass, it had an eye-catching appeal to it. It was also located not far from where my father, Dr. Wayne Shearer, spent the first few years of his life and where his mother’s family lived for decades. 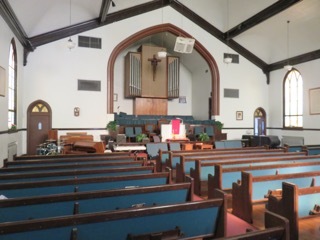 I wrote at the time that I hoped to get a future tour of a couple of interiors of these churches, thinking the old Manker Memorial church – now the site of New Jerusalem Missionary Baptist Church -- would be the one I most wanted to see. I actually called the church’s phone number I found, but got a busy signal. I started working on other stories and forgot about following up, but then last weekend I received a nice email from Deacon Ron Griffin, the church’s vice chairman. I would later learn that he found out about the story from someone in California, but he thanked me for the article and historical information and said he was also interested in history. 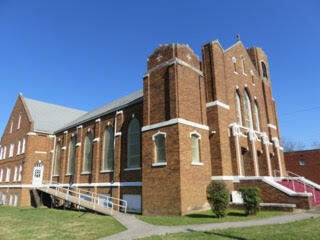 A tour of the church was quickly offered, so last Monday morning I found myself on North Chamberlain Avenue. There to greet me was not only Mr. Griffin – a Riverside High graduate who spent 20 years serving his country in the Marines – but also several other church members who were there for various reasons. They were literally all building up the kingdom of God through Christ, and I don’t mean just by their smiles of goodwill with which they met me. They had recently put a roof on the structure and have some other needed repairs planned to shore up where some leaks and other problems have developed. They also recently put in a new women’s restroom. 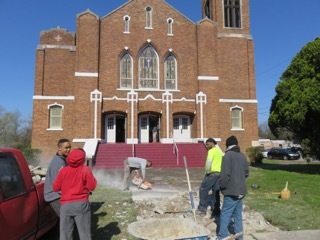 And on this day, they were literally pounding the pavement for God by trying to break up the old concrete sidewalk in front of the church, a walkway that over the years had become cracked, broken and uneven in several places. “I told them we’re going go make the corner beautiful,” said Mr. Griffin, adding that they hope to be part of the collective Glass Street area rejuvenation efforts that have been in the news. It quickly became evident to me they not only love the Lord, but they also adore their historic building. 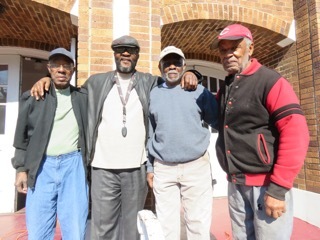 Others there at the church on Monday included chairman John Melvin Hampton, trustee Nathaniel Williams, and longtime maintenance and church worker Mickey “the Supervisor” Cummings. Also, three or four others of varying ages were busily working on rebuilding the sidewalk. As I mentioned in the previous story, the church building had been constructed in 1925 and was designed by architect James G. Gauntt and built by contractor Mark Wilson. The church congregation had been around for a number of years before the building was built and was formerly located at the corner of Glass and Campbell streets. 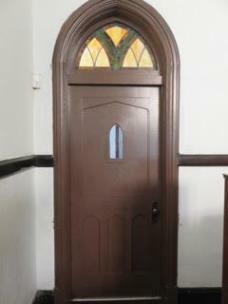 It was previously called Sherman Heights Methodist Episcopal Church. 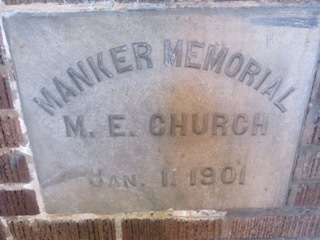 The first year it was listed in the Chattanooga city directory under the name Manker Memorial was in 1903. Since the Rev. John J. Manker, a local Methodist church leader, did not die until 1916 after suffering a heart attack while giving a talk at the Methodist Church’s General Conference in Lake Chautauqua, N.Y., the naming is a little bit of a mystery. Perhaps it was in honor, not in memory of, him, and the memorial part was in reference to other members of the church or possibly one of Dr. Manker’s family members at his wishes. Dr. Manker was the father of prominent Chattanoogan Mrs. John Patten, whose husband also died suddenly just three weeks before Rev. Manker’s death. The Methodist church leader, who at one time served First Methodist, or the downtown Stone Church that still has its steeple remaining, was also the grandfather of Manker Patten, for whom the tennis center by UTC is named. 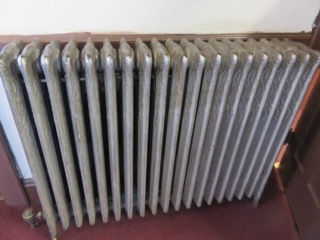 Mr. Griffin, who was actually a tennis ball boy at the Manker Patten center as a youth and whose father was the chief baker at the Hotel Patten, said he would love for the church to reconnect with members of the descendant Patten families as a gesture of goodwill. After the current East Chattanooga church edifice was built, one of Manker Memorial’s pastors during the middle part of the century was the Rev. Ralph Mohney, who later served the larger First-Centenary UMC in downtown Chattanooga for a number of years. He was the husband of well-known newspaper columnist Nell Mohney. Manker Memorial later merged with another church, King Memorial Methodist, and came up with a new name of East Chattanooga (United) Methodist. The church stayed at the site until 1991. It then vacated the building after merging again with St. John United Methodist Church off Highway 58 and its former members began worshiping there. According to the Chattanooga city directories from the 1990s, the church building remained vacant for about five years. 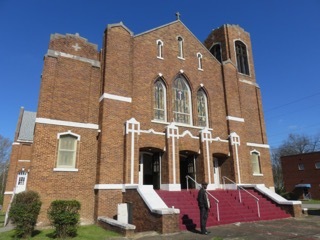 I learned from the New Jerusalem church members that they had located to the old Manker Memorial building in 1996, taking a ceremonial walk from their former church building at Ocoee and Taylor streets as part of the dedication. According to the city directories at the Chattanooga Public Library, New Jerusalem first took on its name in 1979, which was also when pastor Thomas L. Jones began serving as the minister. He would lead the church for 38 years until his death in September 2017. He had also worked at Signal Mountain Cement for a number of years. Prior to that, the New Jerusalem congregation had been known as Memorial Missionary Baptist Church. With the help of Mr. Cummings, Mr. Griffin and later Mr. Williams, I got a full tour of the North Chamberlain Avenue structure. Although New Jerusalem’s members have obviously put their own mark on the place by converting it to meet their worship needs, to me it still had the obvious look of an old Methodist church. That included the nave/sanctuary with all its beautiful wood trim -- from the doors leading into it, to the trim on the balcony, to the exquisite and unique wood cross shapes lining the communion/kneeling rail. It also has some stained-glass windows that look a lot like larger versions of the ones at Red Bank United Methodist where I grew up attending. 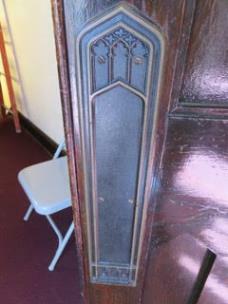 And the doorplates around the church have interesting brass designs in them. 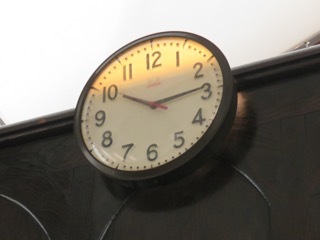 The sanctuary also has a vintage clock by the balcony – faced toward the pulpit and obviously intended for view by the pastor and other worship leaders to keep track of time. 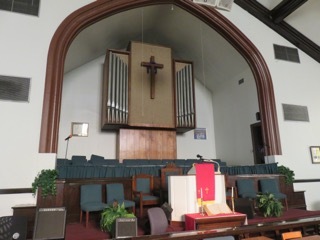 The choir loft and altar area definitely look a lot like a typical Methodist church. Where once an organ and piano were used, New Jerusalem also has other instruments. 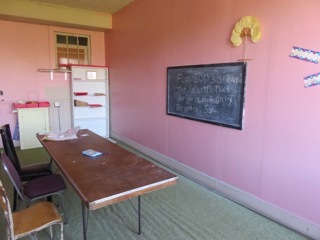 In the upstairs area of the education wing are several old-style Sunday school classrooms, most of which are not currently being used. Below the nave and education wing are uniquely two large meeting rooms, not the one that is typical in most mid-sized churches. 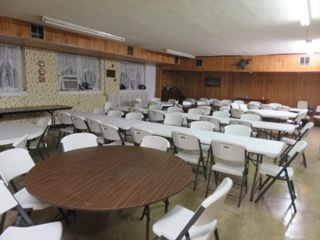 One sits by the kitchen, while the larger one features an old-style stage that was typical for Methodist churches from that era. 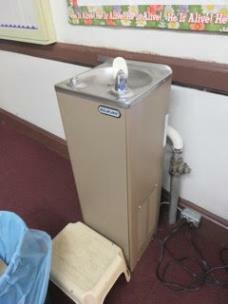 Behind the stage’s curtain is a small baptismal pool that New Jerusalem uses for baptisms. 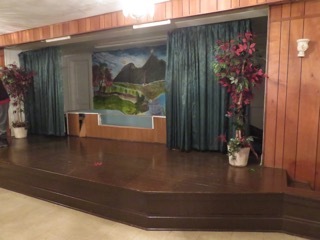 The old linoleum floor tiles in the room with the stage have had some slight damage due to a leak through one wall, another problem the church is planning to fix. A gym is also part of the upper, attic-like floor of the education wing, but church members say they have never seen an access to it or been up in it in their 20-plus years of using the building. The church also includes a nice bell tower, but, like many such church towers, does not currently have a bell in it. Church members went up through the tower when putting on a new roof not too long ago, they said. 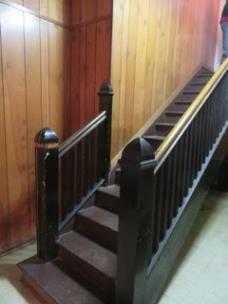 Three stones are also built into the interior stairway area by the side entranceway. Two of them are “In Memoriam” markers listing people with such last names as Fry, Zimmerman and Barger. 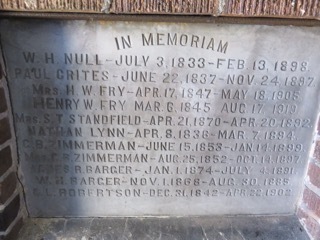 They all died in the late 1800s or early 1900s. 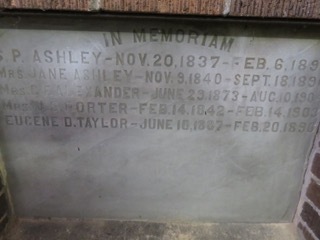 Another stone says Manker Memorial M.E. (Methodist Episcopal) Church, accompanied by the date of Jan. 1, 1901. 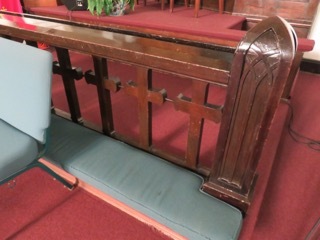 Further research would be required to determine if those stones came from the Campbell Street church or were first put in the Chamberlain Avenue church when it was built in 1925 as part of a memorial fund-raising project. 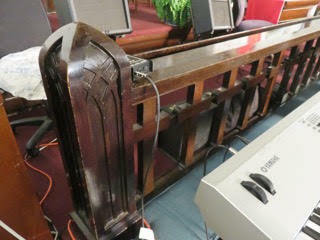 Mr. Griffin said the New Jerusalem church currently has about 50-60 people regularly at worship service. And like with numerous other churches in Chattanooga of varying denominations, many of the members are in their 70s and older. It is for those people that Mr. Griffin said the church wants to do the needed renovation work and become an even better place to worship. Mr. Griffin said he became involved in New Jerusalem Missionary Baptist Church in 2011 after moving back to Chattanooga a few years earlier and has enjoyed helping serve the church in a leadership role. He said he was also touched after his mother, Mary Lee Griffin, died in early 2016 at the age of 97 and pastor Jones offered to have a memorial service there, even though she had been a longtime member of Mt. Ollie Primitive Baptist Church. Old enough to remember when Chattanooga was an industrial city and provided jobs for all people – white and black – he also hopes the church can play a role in trying to rejuvenate East Chattanooga. 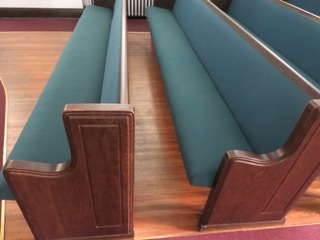 It was not lost on me that while this church building formerly served a white congregation in its early days due to the customs of the time and that it now houses a historically black congregation, one consistent theme was apparent. And that is: those who have worshiped in the handsome church building on North Chamberlain Avenue for nearly 100 years have all been linked by a similar love of Jesus Christ. And that can overcome any human shortcomings and make us whole. 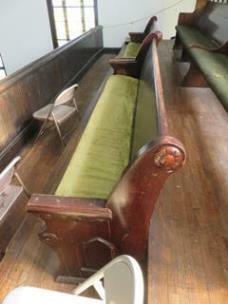 To see the previous story on several of the former Methodist Church buildings in Chattanooga, read here.